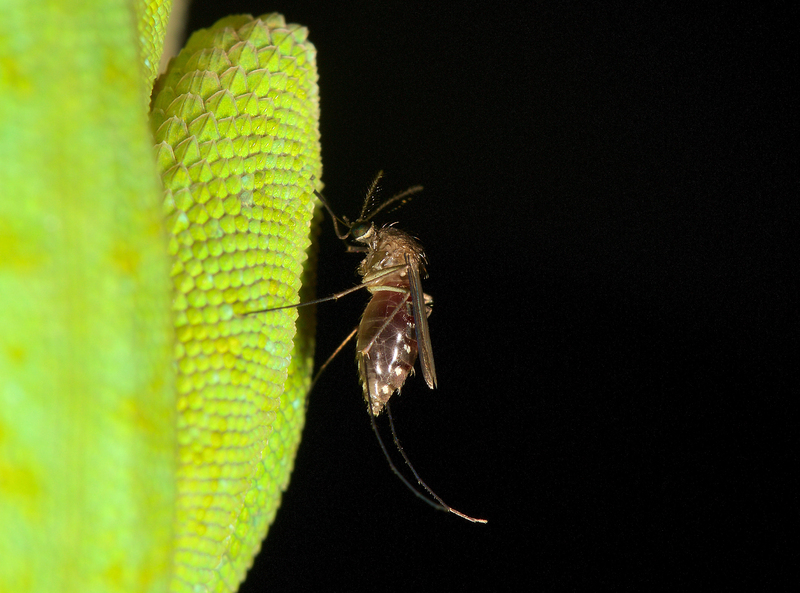 Mosquitoes take blood from a diverse range of animal hosts. Mammals, birds, reptiles, amphibians, and even fishes are fed upon by female mosquitoes. In examining the host-use patterns of a North American mosquito species, we found that the range of hosts fed upon by mosquitoes in nature is broader than previously recognized, and includes the invertebrate phylum Annelida. Uranotaenia sapphirina is a charming mosquito that is common throughout eastern North America. It’s diminutive, even by mosquito-standards, and spotted with iridescent, sapphire-blue scales. This species is associated with freshwater wetlands, and, in these habitats, can reach high densities. Despite this, Uranotaenia sapphirina doesn’t irritate humans, except as a source of frustration among those who have studied its host-use patterns. 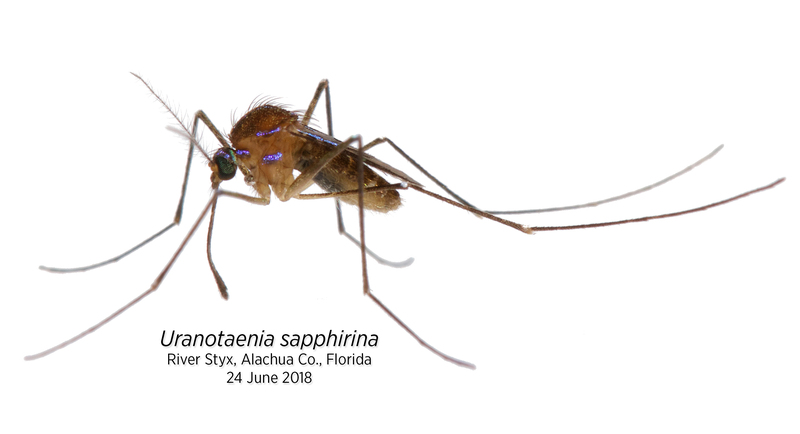 The host animals of Uranotaenia sapphirina have been something of a mystery: females are often found with scarlet-red blood meals in their abdomens, in appearance, not unlike those of any other mosquito species. However, the molecular and serologic blood meal identification techniques used to identify the hosts of mosquitoes generally fail for this species. Females of most mosquito species require proteins, obtained from the blood of a host animal, in order to complete the development of their eggs. Each mosquito species (and there are >3,550 of them) has unique host-use patterns, feeding from a distinct range of host animals. Some species are relative generalists that feed from various animal classes, while others specialize on particular host groups. For example, females of the mosquito Culex erraticus are rather opportunistic and take blood from mammals, birds, reptiles and amphibians, females of Culex territans take blood primarily from frogs and the occasional alligator or lizard, and females of Aedes baisasi take blood from amphibious fish. Culex erraticus feeding from the hind leg of a green anole, Anolis carolinensis, in Osceola National Forest, Florida. Understanding mosquito host-use patterns is important: blood feeding by mosquitoes creates a network that enables pathogens to move between host animals and through ecosystems, potentially affecting humans or our associated pets and livestock. 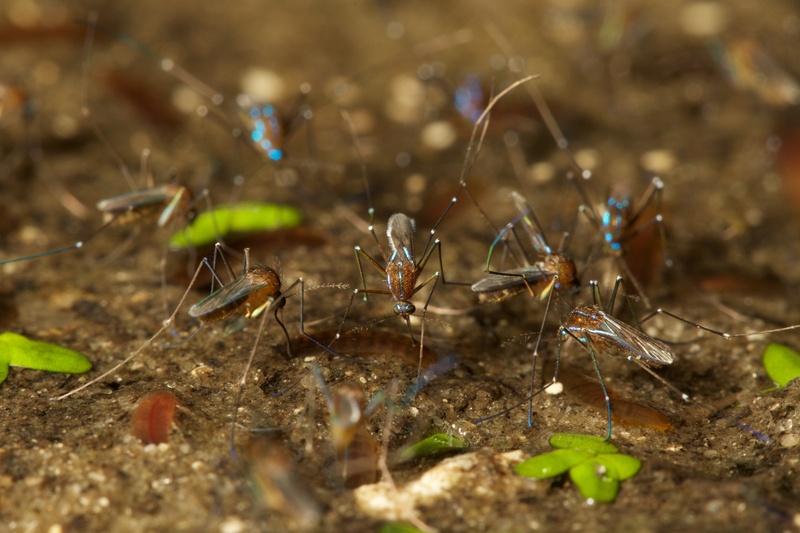 Knowing which mosquitoes feed from which hosts helps us to manage mosquito-borne pathogens, predict public health risks, and respond to emerging mosquito-associated pathogens. To characterize the host-use patterns of mosquitoes, we use blood meal analysis – a collection of serologic and molecular techniques that taxonomically identify a mosquito’s host through its blood meal. Current blood meal analyses consist of a Jurassic Park-esque DNA extraction, PCR amplification of a barcoding gene, and DNA sequencing. By design, these methods target only vertebrate host taxa. In the spring of 2015, Dr. Chris Holderman and I were Ph.D. students at the University of Florida Entomology and Nematology Department, both studying mosquitoes. In our research, we had both encountered blood fed Uranotaenia sapphirina in field collections of mosquitoes. Our curiosity with this species was piqued by a departmental seminar by Dr. Nathan Burkett-Cadena, in which he noted the mystery of Uranotaenia sapphirina host use. That seminar led to a collaborative effort to determine the host associations of Uranotaenia sapphirina. Perhaps Uranotaenia sapphirina steals blood meals from other mosquitoes, and by the time we get mosquitoes collected and DNA extracted, the host DNA has been too severely degraded by digestion to be detected by PCR. We collected blood meals in the early morning hours, presumably shortly after they’d fed, and preserved the freshest specimens upon collection. No amplification. Perhaps our primer sequences are mismatched with the annealing sites of the host taxa. We tried various primer sets used for blood meal analyses. No amplification. Maybe the DNA concentration is too high? Or the MgCl2? Or the annealing temperature? We adjusted all of these, stepwise. No amplification. With nothing working, I looked into another thought: Maybe there was something in Uranotaenia sapphirina tissue that was inhibiting the PCR. I ran a series of PCRs with arthropod DNA barcoding primers. Each one amplified exactly as it should, indicating that something else was causing the problem. If you go out at night looking, with a good headlamp, you can find mosquitoes feeding from their hosts. 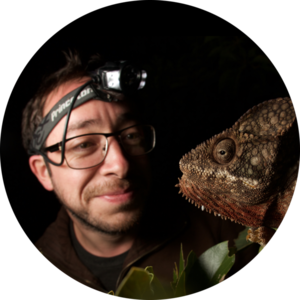 Calling frogs, sleeping birds and lizards, mammals, crocodilians, snakes – if you can quietly approach these animals without disturbing them, you may notice the mosquitoes. Knowing that female Uranotaenia lowii (the only other Uranotaenia species in Florida) are easily found feeding from their anuran hosts, I figured that if the lab work wasn’t going to tell me anything, I’d try my luck with field observation, spend a night palling around with Uranotaenia sapphirina in a swamp, and maybe catch them in the act of feeding from a host. Uranotaenia lowii, the only congener sympatric with Uranotaenia sapphirina, feeding from the eye of an American bullfrog, Lithobates catesbeianus, in the Osceola National Forest, Florida. The River Styx is a real place. It’s in Florida. It’s a densely vegetated waterway, habitat for cottonmouths, alligators, sirens, and amphiumas, flowing through cypress swamp and connecting Payne’s Prairie to Orange Lake in Alachua County, just south of Gainesville. Marjorie Kinnan Rawlings wrote about the River Styx in her book, Cross Creek, but beyond that, it's known only to the locals who fish or frog there, and to a few plant, reptile, or bird nerds from the greater Gainesville area. It was my first real field spot, and since I learned to drive, I’ve been a regular – frequenting the River Styx and keeping tabs on its biodiversity and ecosystems, taking friends out for a night of calling in barred owls, hunting around for snakes, or collecting mosquitoes and other insects. Through these visits, I knew River Styx was a good place to start looking for Uranotaenia sapphirina. 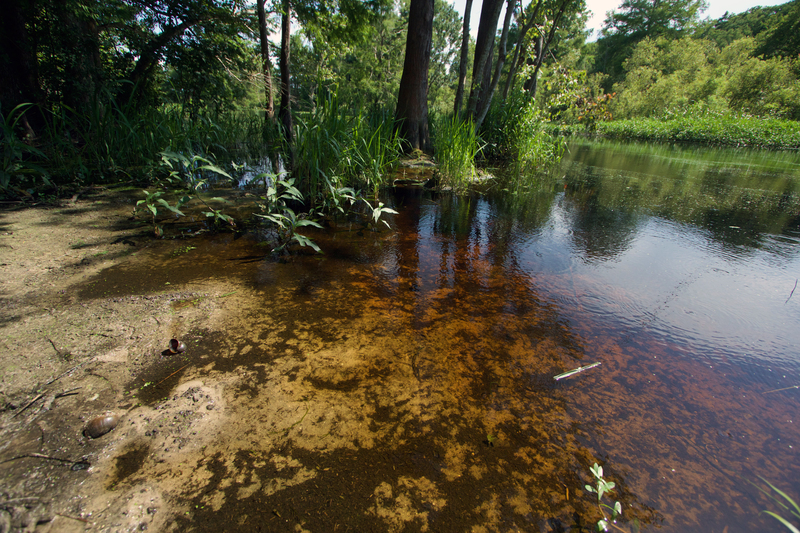 The River Styx, in southern Alachua County, Florida. It was September 12, 2015 when I’d run the PCR on Uranotaenia sapphirina blood meal DNA extracts using arthropod DNA barcoding primers. That evening, I picked up a double espresso and made my way south, out of Gainesville and across Payne’s Prairie on US 441, turning east in Micanopy toward Cross Creek. It had been dark for an hour or so by the time I arrived. I pulled off the road and started poking around for mosquitoes and host animals. Coquillettidia perturbans, Mansonia spp. and Culex erraticus mosquitoes promptly found me. I walked toward the water’s edge, camera in hand, scouring the edge of the swamp as I walked. I knew to look closely at the herbaceous vegetation growing at the margins of the water. Adult female Uranotaenia sapphirina feeding from oligochaete earthworms, likely Sparganophilus tennesseensis, at River Styx. As it turns out, annelids have red blood. 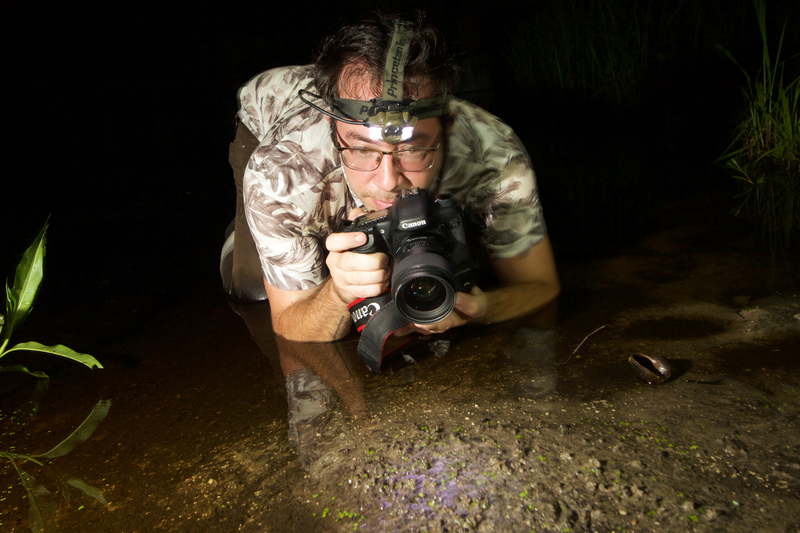 Reviewing more and more photos, it became obvious that this was not something incidental where the annelids and mosquitoes just enjoy the same microhabitat. They were interacting. The mosquitoes were ambling around in the mud, like mini roseate spoonbills, probing around with their proboscises. When they stumbled into a host, they began feeding. Once a photo clearly showed the reflexed proboscis of a mosquito touching a worm, stylets exposed, I knew that this was the answer: Our PCRs weren’t working because, like everyone else performing blood meal analysis, we were using primers that parse vertebrate from invertebrate DNA templates, and these primers don’t amplify annelid templates. Satisfied, I made a few excited phone calls from the bridge that crosses the River Styx, and headed back to Gainesville. Lawrence Reeves stalking Uranotaenia sapphirina from the shallows of River Styx. Photo by J. Bremer. After identifying annelids as the putative primary hosts of Uranotaenia sapphirina through field observations, we then decided on a molecular route of quantifying their host-use patterns. We fished around trying to find primer sets that could amplify annelid, but not mosquito DNA, designed Uranotaenia blocking primers, but ultimately settled on an approach that used a primer designed de novo to avoid co-amplification of mosquito templates. There are a lot of implications to recognizing annelids as the hosts of Uranotaenia sapphirina. I hope that with this recognition, researchers around the world will look closer at Uranotaenia species and their host-use patterns (and those of other mosquito genera). In the US, there are only three Uranotaenia species, but globally, and primarily in the tropics, there are 270 described species, and for the vast majority, nothing is known about their host-use. I think it will be especially interesting to see what these species are feeding on in tropical forests, and whether Uranotaenia sapphirina is an outlier or the norm for this genus. Video of Uranotaenia sapphirina feeding from hosts. I am interested in mosquitoes, and the biodiversity with which they interact.